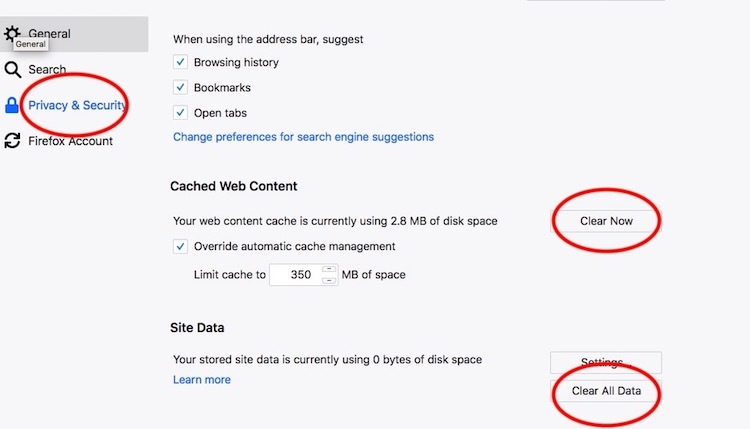 Startseite » Blog » How to clear the Firefox browser cache? This tutorial is written for Mac users, but it should also apply for Windows users. For clearing the cache in the Firefox browser, go to: Firefox > Preferences > Privacy & Security, scroll to the Cached Web Content section and click the ‘Clear Cache‘ button. Additionally, go to the Site Data section, here you also need to click the ‘Clear all data‘ button. Now close the browser and open it again to start a new session. This should clear the cache in most cases. Firefox clearing the cache didn’t work? Browser still shows cached data? A pop-up window will open where you can select how much of your history you want to clear. 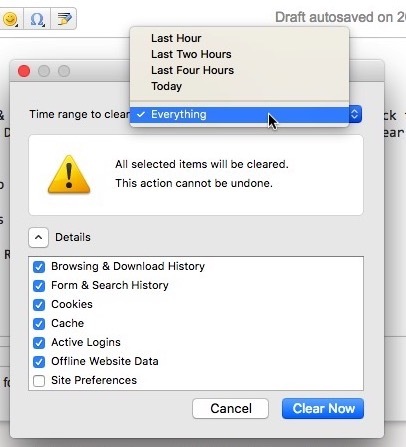 To be sure, you can select ‘Everything‘ in the time range field and click the ‘Clear now‘ button. Note: This clears all your browsing history. If you don’t want this, you could try first to delete todays files and see if this is enough. Don’t forget to close and reopen the browser. Now you should see the website you want in the uncached version.